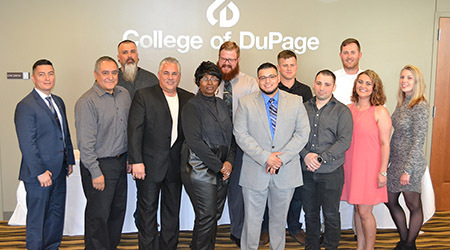 The College of DuPage Veterans Services office recently celebrated the accomplishments of more than 100 veteran students who earned certificates and degrees during the 2016-2017 academic year. Several students were honored at a recent awards ceremony, including, from left, Alberth Velasco, Pablo Sosa, Jason Pena, Craig Panson, Christine Kelly, Jacob Meyer, Adrian Raygoza, Robert Owens, George Murad, Brian MacArtney, Courtney Flannery and Jessica Ouellete. Regionally accredited by the Higher Learning Commission, College of DuPage serves approximately 28,000 students each term, and is the largest public community college in the state of Illinois. The College serves more veterans than any other college in Northern Illinois and grants nine associate degrees and offers more than 170 career and technical certificates in over 50 areas of study. The College recognizes a number of tuition-based veteran education bills, including the Montgomery G.I. Bill for Active Duty, Survivors and Dependent Educational Assistance Program, and the Reserve Educational Assistance Program. COD also accepts the Post-9/11 G.I. Bill, which provides a maximum benefit of free tuition, a monthly housing allowance and a yearly book and supply stipend for qualifying veterans. For more information about College of DuPage, visit www.cod.edu. For more information on education benefits available to veterans returning to school, visit cod.edu/admission/veterans.